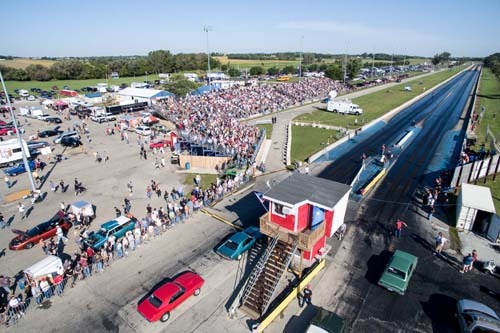 Great Lakes Dragaway, nicknamed "The Biggest Little Track in the World," has entered into a multi-year sanctioning agreement with the International Hot Rod Association (IHRA). The Paris, Wisconsin track with a Union Grove post office address is the oldest purpose-built drag strip in America. Track co-founder Marge Bennett first called it the "Dragaway" as a place her friends could drag away. Steeped in drag racing history, first opening in 1955, it has hosted the biggest names in the sport such as 17-time world champion "Big Daddy" Don Garlits and Tom "The Mongoose" McEwen.Legendary promoter "Broadway Bob" Metzler, the first promoter ever inducted into the International Drag Racing Hall of Fame, brought in concerts, parades, the circus and even motorcycle daredevil "Evel" Knievel. Current track owners Randy Henning and Marcel Kuper have continued to build upon that glorious past and have made improvements to the facility highlighted by a quarter-mile drag strip. Henning is an accomplished racer, first going down the track as a 16-year-old in a 1952 Chevrolet. He has since piloted a variety of cars including an Alcohol Funny Car and a jet dragster. "It's a racer-forward venue, with emphasis on the family, programs and facility," IHRA Division Director Jon O'Neal said. "Randy and Marcel have done well to keep the facility up to date without losing the charm and feel of the grounds. For instance, the state-of-the-art poured concrete retaining walls flank the old-school center perched control tower." The track has a number of special events throughout the season including the Night of Fire, Larry's Fun Fest, as well as No Prep and Nostalgia events. It also boasts a strong IHRA Summit SuperSeries program with the 2018 track champions Chris Burden (Top), Alex Olessenski (Mod) and Kyla Feit, who went on to capture the IHRA Summit SuperSeries Junior Dragster World Championship in October. Another Junior Dragster racer, Mason Osborne, finished runner-up at the IHRA Division 5 (Thunder) Summit Team Finals after winning the Gambler's Race the previous night. It truly has a family atmosphere and is a place where the whole community comes together. "You run into people around the country and say, 'Great Lakes Dragaway,' and they say, 'Union Grove, Wisconsin,'" Henning said. "It's really in Paris, but our race track is strong and where it has been here so long, it's truly a part of the community where everyone takes pride in it." For more information about Great Lakes Dragaway click here. For a list of IHRA member tracks click here.